Come, Holy Spirit, by whom every devout soul, who believes in Christ is sanctified to become a citizen of the City of God! (en. Ps. 45:8) Come, Holy Spirit, grant that we receive the motions of God, put in us your flame, enlighten us and raise us up to God (s. 128. 4). “So he got up and went back to his father. While he was still a long way off, his father caught sight of him, and was filled with compassion. He ran to his son, and embraced him, and kissed him. His son said to him, ‘Father, I have sinned against heaven and against you; I no longer deserve to be called your son.’ But his fathered ordered his servants, ‘Quickly bring the finest robe and put it on him; put a ring on his finger and sandals on his feet. Take the fattened calf and slaughter it. Then let us celebrate with a feast, because this son of mine was dead, and has come to life again; he was lost, and has been found.’ Then the celebration began. “The man with two sons is God, who has two people. The elder son is the Jewish people; the younger, the gentile people. The inheritance received from the Father is the intelligence, the mind, the memory, the ingenuity all that God has given us so that we may know and adore him. After receiving this patrimony, the younger son went to a distant region: far away, i.e., so that he forgot his Creator. He squandered his inheritance on a life of dissipation: spending and not acquiring, squandering what he possessed and not acquiring what he did not have; i.e., consuming all his talent in extravagance, in idols, in every kind of perverse desires whom the Truth called prostitutes. It is not strange that after this extravagance would follow hunger. A severe famine struck that country: not the hunger for visible bread, but the hunger for invisible truth. Impelled by necessity, so he hired himself out to one of the chief citizens of that country. The devil is understood here, the chief of the demons, to whom all the curious hire themselves, since all curiosity elicits nothing else but the pestilence of want for truth. That son, snatched away from God by the hunger of his intelligence, was reduced to slavery and he has to care for pigs; i.e., the ultimate and impure slavery that the demons usually enjoy. In effect, not in vain did the Lord allow the demons to enter the herd of pigs. Here they were fed with pods that did not satisfy. The pods, we think, are worldly doctrines that make loud noise but do not satisfy; fit to feed pigs but not men; i.e., they satisfy the demons, but do not make the faithful righteous. Finally, he became conscious of his situation, what he had lost, whom he had offended, to whom he had hired himself. Coming to his senses, first to himself then similarly to his father. Perhaps he had said: My heart abandoned me, thus it was necessary that he first return to his heart, and in this same way, realize that he was far from his Father. Similarly the Scriptures reproach some men saying: Return, you corrupt people, to your heart. Having returned to himself, he found himself in misery. He says: I have found the tribulation and the pain, and I invoked the Name of the Lord. How many hired workers of my Father have bread in abundance, while here I perish in hunger! How did this come into his mind if not that the Name of God was already being proclaimed? Certainly, some already had bread but not rightfully because they sought another thing. Of these it is said: In truth they already have received their reward. The Apostle referred to those men when he said: Let Christ be preached, for opportunism or for the truth, it does not matter; they may be hired workers or sons. The Apostle wants us to think that those who seek their own interests are hirelings, by preaching Christ they have plenty of bread. He gets up and returns, because after having fallen, he had been prostrate on the ground. His Father sees him from afar and comes out to meet him. The word is in the Psalm: You have known my thoughts from a distance. Which thoughts? Those he had interiorly: I will say to my Father: I have sinned against heaven and against you; I no longer deserve to be called your son, treat me as one of your hired workers. Indeed, he had not yet said it, but only thinking to say it; nevertheless, the Father heard it as though he had said it. Sometimes one finds himself in tribulation and in temptation and thinks of praying; and with the same thought reflects on what he is to say to God in prayer, like a son who leans on his right and claims the mercy of the Father. And he says interiorly: “I will says this and that to God; I fear not that on saying this with these tears, my God may not hear me.” Most of the time He is already hearing it while he was ‘saying this’, because even while reflecting he was not hiding any thought from the eyes of God. When he was disposing himself to pray, He was already present who is to be there when he starts to pray. Thus another Psalm says: I have said, I will declare against myself my sin before the Lord. See, how he came to say something interiorly; see that he had proposed it. And immediately he added: And you forgave the perversity of my heart. How near is the mercy of God to him who confesses his sin. God is not far from the contrite of heart. Thus it is written: The Lord is near to those who are contrite of heart. Therefore, that son in the region of misery already had a contrite heart; he had returned to tear it to pieces. Proud he had abandoned his heart and angered he had returned to it. He got angry to punish himself, to punish his own perversity; he had returned to merit the goodness of the Father. He was angry being conformed to the words: Be angry but do not sin. Indeed, everyone who repents is angry with himself since by becoming angry he punishes himself. From here proceeds all movements proper to one who repents and is truly sorrowful. (s. 112A, 3-5 = s. Caillau 2, 11, 3-5). “I shall get up and go to my father and I shall say to him, ‘Father, I have sinned against heaven and against you; I no longer deserve to be called your son” (Lk. 15:18-19). How can I apply this statement to my life? 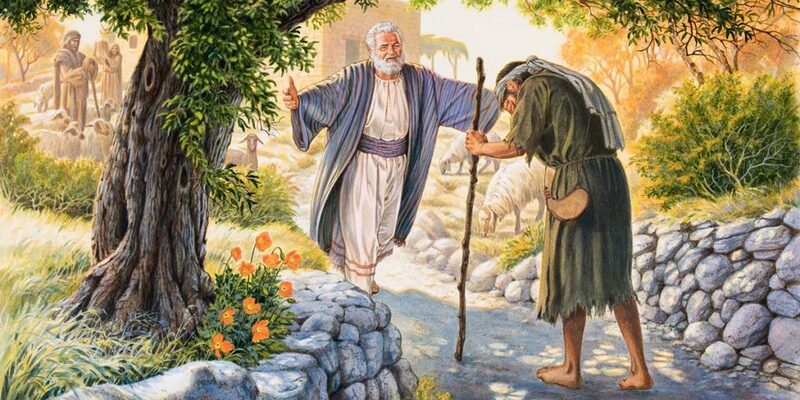 If you were the Prodigal son, what would you say to the Father when you arrive at his presence? “How near is the mercy of God to him who confesses his sin!” (s. 112A, 5). How would you explain this statement? What experience have you had of the mercy of God? Contemplate the Father who runs to meet his son to embrace him and that he does not allow him to finish the words he had prepared. Contemplate his great mercy, and you yourself, allow yourself to be embraced by Divine Mercy. Contemplate the joy and the happiness of the feast. Identify yourself with the prodigal son and feel the jubilation of someone who has passed from death to life. How can I apply this text of Scripture at this moment of my life? What lights does it give me? What challenges does it put before me?